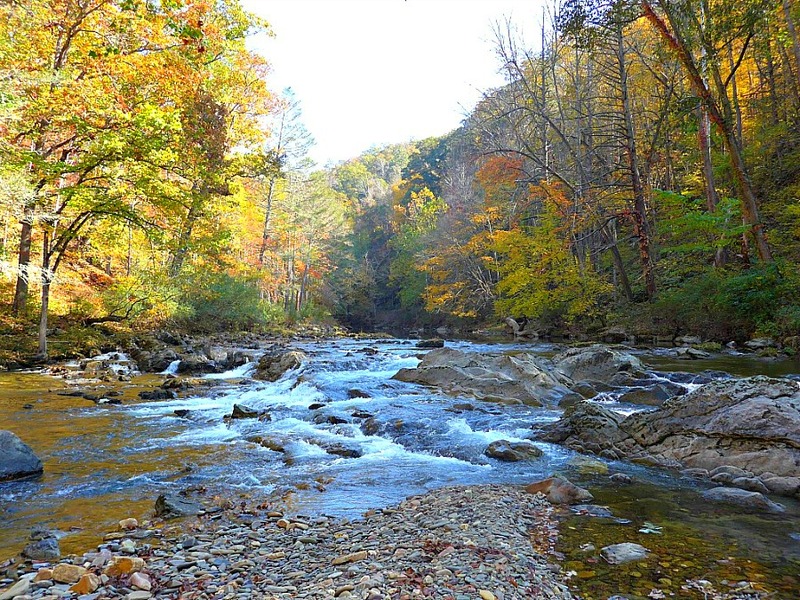 As leaves begin to turn from green to crimson and gold, trout anglers begin to think of fishing streamers. While streamers can, and probably should, be fished throughout the year, few question their especial efficacy in the fall. This is particularly true in streams inhabited with fall spawners, that is, brown and brook trout. Exhausted from spawning, and faced with the meager food offerings of winter, they look for big meals. So what exactly is a streamer? Many would say that a streamer is a baitfish imitation. But for this discussion, I am going to enlarge the scope to include flies bigger than soft-hackles, and fished subsurface. In addition, the angler often manipulates them to simulate a swimming motion during at least a portion of their presentation. Thus “streamers” include baitfish, trout fry and leeches. I am not including crayfish, as I don’t personally fish them on trout streams; perhaps a mistake. The lowly sculpin is a cold-water baitfish, inhabiting almost all trout streams. It has an over-sized head, and tapered body. It spends most of its time scuttling about the streambed, and its coloration camouflages it to blend in. I always carry a variety of sculpin patterns, mostly in tans and olive, typical streambed colors. For the head, I favor bunny fur or hackle rather than deer or elk hair. The former materials sink, while the latter are air-filled and rise in the water column. 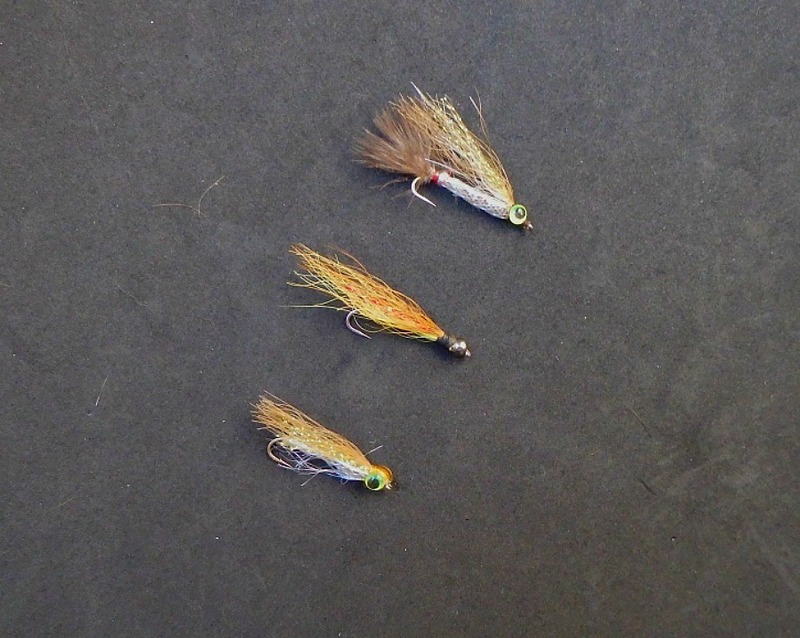 I use sculpin helmets, cone-heads, bead-heads or lead-eyes to provide weight to the fly. How big should baitfish streamers be? The recent trend is upwards of six inches! But very few trout reach a size able to ingest such a large fly. Fortunately, smaller flies catch the big ones too, while also catching other good-sized trout. 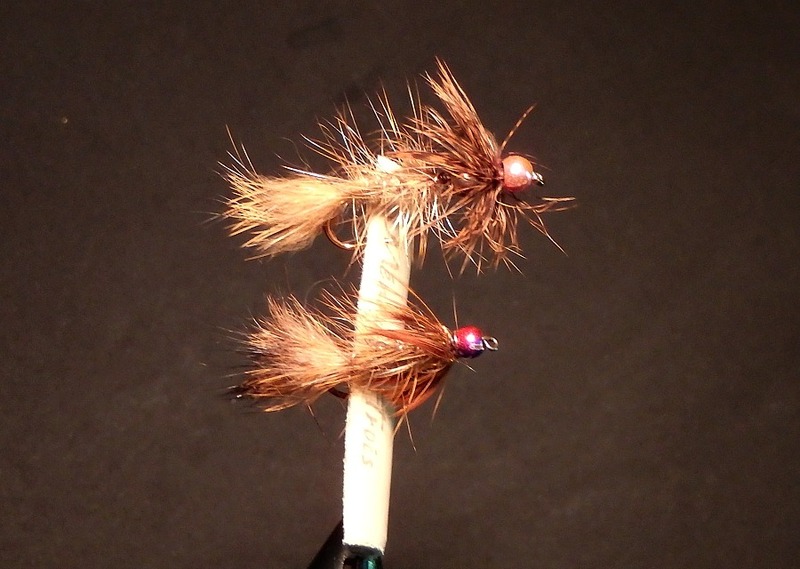 Thus I tie most of my sculpin patterns 3-4 inches in length. In these lengths, I don’t feel that articulated patterns add much, but do use them when fishing larger flies. I don’t see many dace, another baitfish, in the streams that I fish. Therefore, I don’t load my fly boxes with them. In contrast, trout fry inhabit all healthy trout streams, and I carry both rainbow and brown trout patterns. I tie them 1 1/2 -2 inches in length, most with prominent eyes. My favorite streamer is the woolly bugger. While no one knows what they represent, judging by trout behavior, they must imitate many luscious trout foods. In addition, they are one of the most versatile subsurface flies. I fish them all year ’round, in a variety of colors and sizes, most often with a bead-head. Streamers can be presented with a variety of techniques. 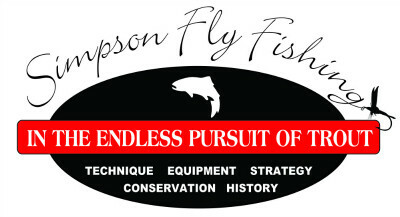 Both technique and fly choices should be determined by conditions present on a stream. So let’s look at a few common scenarios. Undercut banks provide great cover for holding trout. To lure them out, I usually begin with a presentation of food-flies. My favorite flies are woolly buggers, closely followed by sculpin patterns. I cast them upstream, and make enough upstream mends to allow the flies to sink in the water column. When they have reached the desired level, I let them dead-drift through the undercut. If this fails to get a strike, I try imitating a wounded or weakened fish. This is done by alternately stopping and resuming the drift when the fly is downstream of me. As the drift is stopped, the fly rises in the water column. When released, the fly drops, head-first, just as a wounded fish would. If an offering of food imitations fails to draw strikes, I turn to challenging the holding trout’s lie. This is done by casting a fly directly to the undercut bank, then stripping it vigorously. This technique relies on a trout’s instinct to defend its lie. This often draws fast, smashing strikes! Riffles and weedy shallows harbor both trout fry and aquatic insects. When fishing these waters, I use woolly buggers and trout-fry patterns. Feeding trout lurk in the soft spots of riffles, and along the edges of shallow and deep water. I cast my flies up or across stream, and let them dead drift. As they approach possible lies, I give them a twitch, so as to present a lateral profile. At the end of the drift, I swing them to a position directly below me, and let them rise toward the surface. Trailing fish often strike at the start of the rise. When fishing riffles and shallows, I usually fish a tandem rig. Nymphs and wet flies make excellent trailers. I attach them to my streamer, hook-eye to hook-eye, using 12-18 inches of tippet. The smaller the trailer, the shorter the tippet. This helps keep a tight connection. Lastly, lets consider deep runs. I’ll define deep as a run greater than 4 feet in depth. I usually change to a sinking-tip line with a short piece, 3-4 feet, of tippet. This helps get the flies down to the stream bottom, and maintains a tight connection to them. The bottom of a deep run is shaped like a bowl. Trout most commonly hang at the head and tail. Therefore, if possible, I cast just upstream of the run, and let my flies tumble into the run. If nothing happens, I proceed with upstream mends to get the flies down. After reaching the desired depth, I flip a downstream mend. This pulls the flies into a downstream drift, and maintains a tight connection. Similar to fishing undercut banks, I’ll try both dead-drift and wounded-fish presentations. When they reach the tail, I swing them across the stream, presenting a lateral profile to any feeding fish. I finish by allowing time for the flies to rise toward the surface, then recast. When fishing deep runs, I almost always fish a tandem rig. Usually I use a nymph, tied hook-eye to hook-eye. 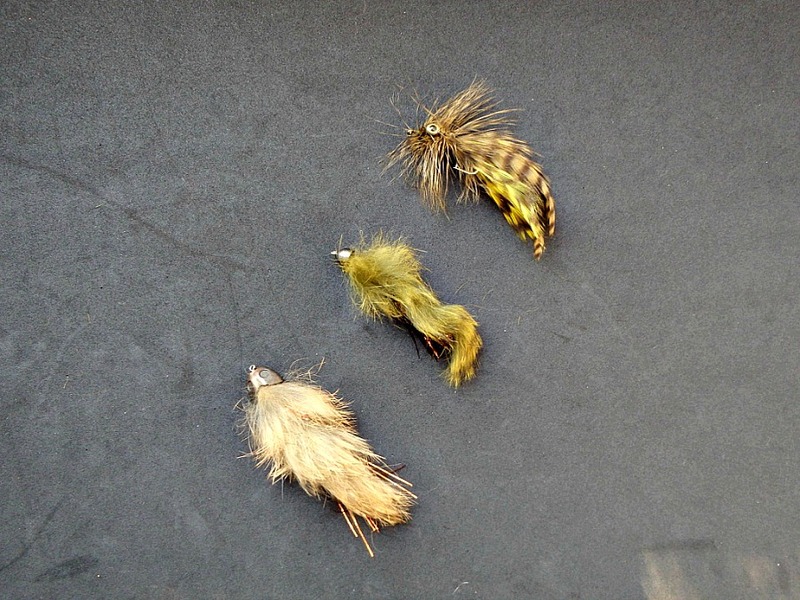 But if I know the stream has caddis flies, I’ll often use a soft-hackle wet fly for the trailer. This is especially effective when allowed to rise at the end of the drift. Fishing streamers is a great way to prospect for trout when there is no hatch present. It is important to cover a lot of water, and to match a technique to the water at hand. And remember, streamers work all year ’round! written by Al Simpson, November, 2018.